A prospect view of the city of Varanasi (Benares) spread out along the bank of the Ganges from Shivala Ghat to Aurangzeb's mosque, with the camp of the Mughal Emperor, Shah 'Alam II, on the right bank of the river. This water-colour drawing was made by an anonymous artist in 1765. 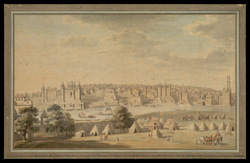 Inscribed on the front in ink is: 'The Famous and Ancient City of Benares with a View of the Great Mogul's Camp on the opposite side of the Ganges, the 15th of January 1765 when Sir Robert Fletcher left his Majesty and marched to attack Shujah ul Dowlah, and to Conquer the Dominions of that Prince'. Shah Alam II was born Ali Gauhar on June 15, 1728 at Delhi, India. He was the son of the emperor Alamgir II but was forced to flee Delhi in 1758 by the minister Imad-ul-Mulk, who kept the emperor a virtual prisoner. He took refuge with Shuja'-ud-Dawlah, nawab of Oudh, and after his father's assassination in 1759 he proclaimed himself emperor and was nominal Mughal emperor of India from 1759 to 1806. Sir Robert Fletcher (?-1776) was Commander-in-Chief, Madras, 1772-76.